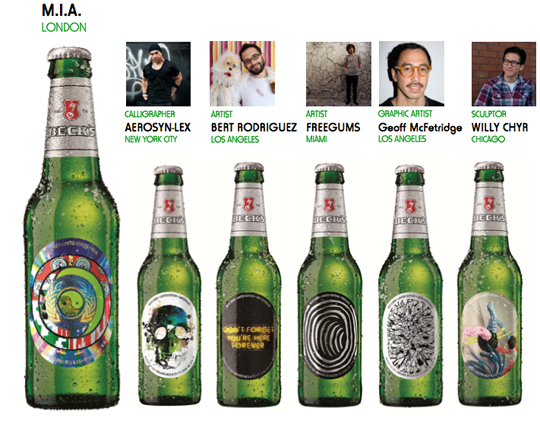 I am very happy to announce that I’ve been chosen as one of six artists in the first series of limited edition Art Bottles from Beck’s Beer in the U.S.
For those of you not familiar with the Art Bottle series, Beck’s has been featuring the work of contemporary artists on their bottles in the UK for the last 25 years. Some of the artists whose work have graced the green bottle include Damien Hirst, Jeff Koons, and Tracey Emin. This is the first year the Art Bottles will be appearing in the U.S., and the other artists featured are: M.I.A., Geoff McFetridge, Bert Rodriguez, Freegums, and Aerosyn-Lex. Needless to say, I’m extremely excited to be a part of this project and very proud to be representing Chicago. The bottles will be in stores from May 7th through July 2012. This entry was posted in Appearances, Images and tagged Art Bottles, artist, Beck's, Beer, chicago by William Chyr. Bookmark the permalink.